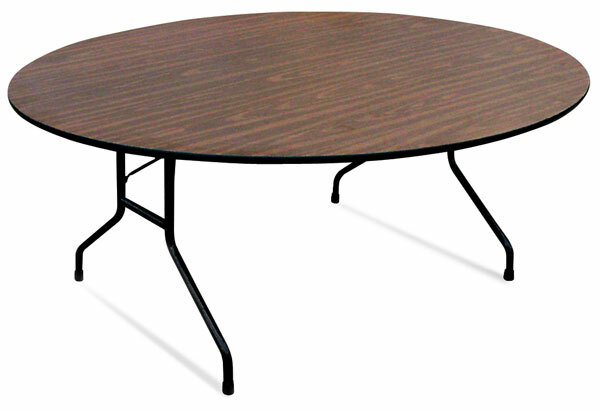 The Correll Round Folding Table is an economical choice for art fairs, trade shows, and light-duty home, office, school, or shop use. Easy to fold and store, the table features a walnut melamine top, brown frame, and black T-mold. The wear-resistant melamine top sits on a 5/8" (1.6 cm) high-density particleboard core that is attached to a one-piece, 1-5/8" (4.1 cm) steel apron to strengthen the table and prevent warping. The 1-1/4" (3.2 cm) diameter, 14-gauge steel wishbone legs are equipped with an automatic locking mechanism to keep the legs securely in place. Also included are mar-proof plastic foot caps and edge molding to protect floors and walls from scrapes and dings. 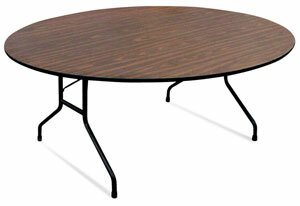 Correll tables are made in the USA.